Blue Surf is extremely proud to be the only Billabong sponsored, upscale surf school and surf camp in Costa Rica’s Nicoya Peninsula! Our Billabong Surf Camps are a perfect combination of vacation and surf experience. If you are a first time surfer, have some experience, or are at an intermediate or advanced level, we are perfect for you! Join us in gorgeous Santa Teresa, Costa Rica and surf in our warm and tropical waters. Experience the true Pura Vida lifestyle Costa Rica has to offer while having a blast learning to surf safely and confidently. Check out our new Surf Experience Trips! Click Here for Details! Our Costa Rica Surf Camps are group experiences based around learning to surf, surfing better, or finding an awesome new place to surf. We have several different themed surf camps that bring people together to experience surfing in a certain way or from a particular point of view. 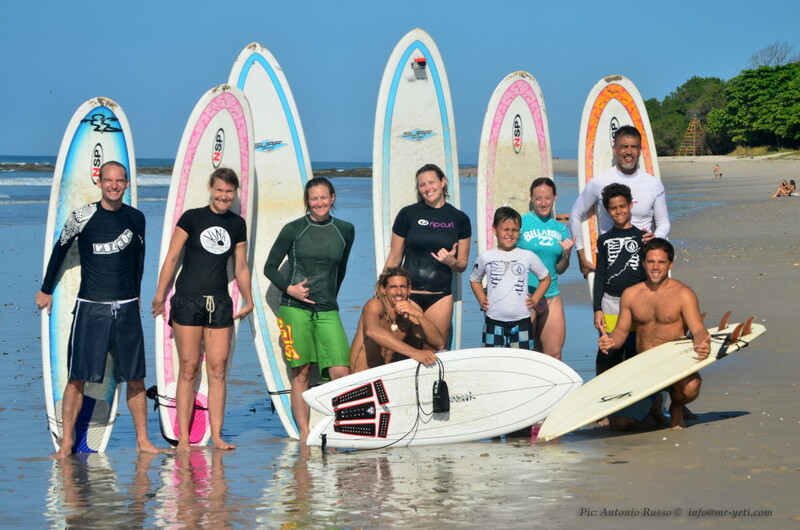 Why our Costa Rica Surf Camps? Our Costa Rica surf camps student ratio is never more than 2 to 1, and often times less as your skills progress. During the week, you may be instructed privately as we base your program solely on your individual needs. With several gorgeous beaches in the area, each offering different surf breaks, we always have suitable fun waves and a safe place to work on your surfing. Surf camps can also be a more inexpensive way to enjoy this experience. Often campers share accommodations, therefore reducing overall cost. If you are a beginner, intermediate, or advanced surfer we have you covered. For inexperienced and beginner surfers, we educate you on surf etiquette, knowledge of the ocean, pre-surf stretches, paddling out, standing up, and all of the necessary skills so you go home stoked and surfing safely on your own. No matter your skill level, our surf instructors will base their lessons around your current surfing ability. Safety is our number one priority here at Blue Surf, and our instructors only educate you in safe environments where you are comfortable learning to surf. We take you to nearby locations based on weather conditions and your skill set, and educate you so you leave surfing safely and confidently. You’ll enjoy stunningly beautiful beaches, tropical wildlife, breathtaking views. Join us and have an incredible surfing adventure today! For intermediate surfers, our instructors will help you boost your skill set by basing your lessons around your current surf level. If you happen to be more advanced than other surfers in your camp, your instructor will spend one-on-one time with you to make sure you’re advancing safely and confidently while enjoying awesome waves and gorgeous beaches. For the more advanced surfer, our instructors will transport you to various surf spots in the area based on weather conditions to ensure you get amazing surf. The Santa Teresa / Mal Pais area offers gorgeous beaches with breathtaking views and incredible surfing. Which Blue Surf Camp should I choose? At Blue Surf we offer a variety of surf camps with several different themes. Check out our currently scheduled Costa Rica Surf Camps and book your surf adventure today! Email us at info@bluesurfadventures.com or contact us at our boutique hotel, Blue Surf Sanctuary.